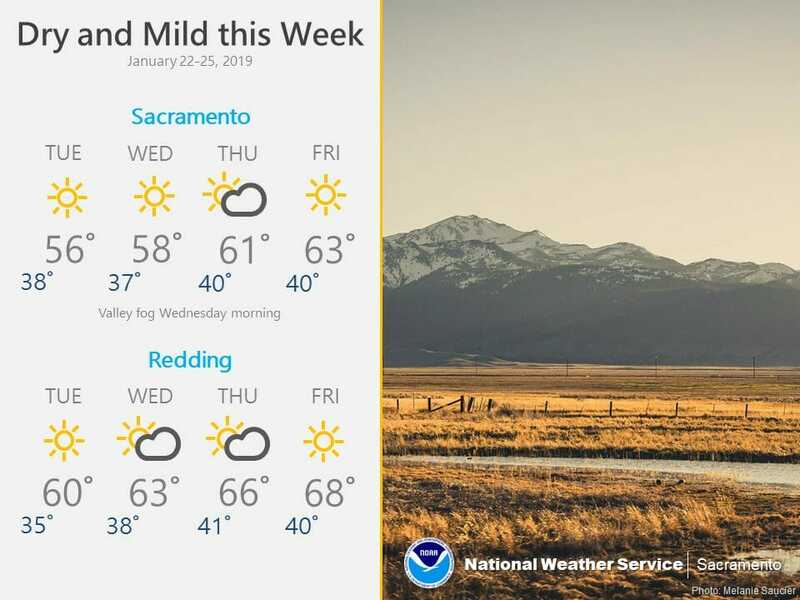 January 22, 2019 – Dry weather with locally breezy northerly winds expected through the week. Other than a few high clouds spilling into NorCal from the north over the building ridge across the eastern Pacific, skies are clear across the region early this morning. Current temperatures are colder compared to 24 hours ago and range from the single digits and teens in the mountain valleys to the upper 30s to around 50 across the Central Valley. Enough north wind early this morning to prevent fog formation in the valley. Breezy northerly winds expected to continue today, especially along the western edge of the Sacramento Valley. Northerly surface gradients relax tonight, so better potential for at least some patchy fog early Wednesday along the eastern edge of the valley. Upper ridge will maintain dry weather with mild days and cool nights through the week. Weak waves moving over the ridge may bring some high clouds at times along with occasional periods of north wind in their wake. 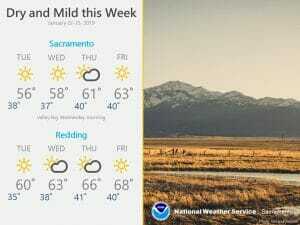 Ridging will lead to quiet weather for the extended part of the forecast. Warmer than normal temperatures are forecast each afternoon, with highs for the valley making it into the 60s while the upper 40s and low 50s will be observed at higher elevations. Low temperatures will generally be around climatological values and may be accompanied with patchy morning fog. Previous articleGovernor Newsom Statement on Dr. Martin Luther King, Jr.